This section will take you through the seasonal movements of Muskie / Tiger Musky at Fireside Lodge in Northwest, Ontario, Canada and also the techniques, presentations, and lure / fly suggestions, which have worked with consistency. The seasonal movements will be over a 12 month period for educational purposes, but keep in mind that Fireside Lodge open season is from the third Saturday in May through and including the second Saturday in September. With this in mind the techniques, presentations, and lures / flies used will, in most cases, be for the open season at Fireside Lodge. The main baitfish and food supply in Little Vermilion Lake System is many different minnows, crayfish, leeches, perch, white sucker, whitefish, and Cisco. Please email me with any questions. 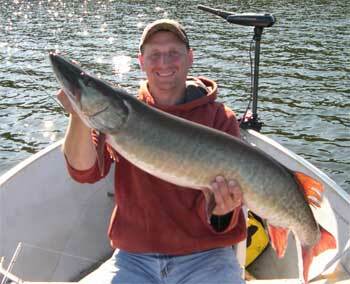 Muskie types available are Clear Musky, Barred Musky, Spotted Musky, and Tiger Musky. All the fishing at Fireside Lodge is catch and release so all Fireside Lodge guests will have the opportunity to experience the fabulous fishing described. Pre Spawn Period: This is the period just after ice out, normally the first week in May until the water temperature reaches about 48 degrees Fahrenheit. 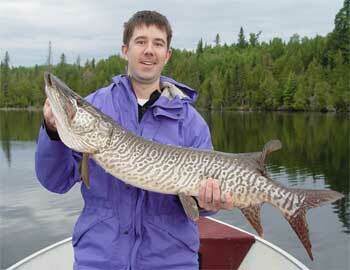 In Northwest Ontario Muskie or Tiger Musky fishing is not open until the third Saturday in June. This date is set by Ontario Fishing Regulations to protect spawning Muskie; therefore because of ethical reasons Muskie or Tiger Musky locations along with fishing techniques, lures and presentations will not be discussed. 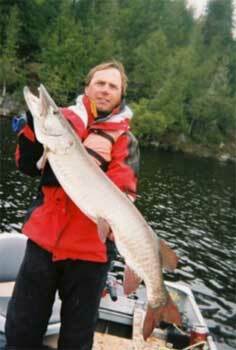 Instead I will give some other interesting information about Muskie. 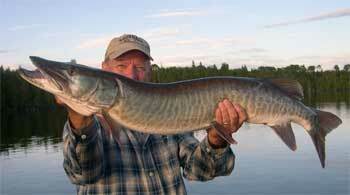 The Ontario record Muskie weighed 65 pounds and measured 58 inches in length and 30.5 inches in girth. 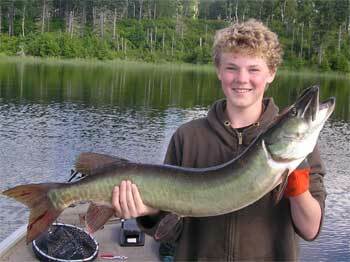 Tiger Musky attains a maximum size of 48 to 50 inches. Muskie and Tiger Musky are big, powerful fish, with sharp teeth, so anglers should have adequate landing and release equipment on board their boat. This includes a big landing net or cradle, (we provide a cradle in every Fireside Lodge boat) long-nosed pliers for removing lightly in-bedded hooks, and bolt cutters for removing deeply in-bedded hooks and those near the fish's gills or eyes. Replacing a 50-cent hook is a small price to pay for releasing a Muskie or Tiger Musky to live and stay in the fishery. A 60-inch tape measure and a camera can be used to record your catch. 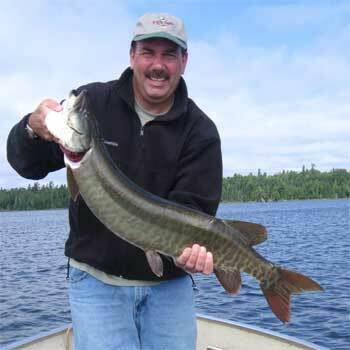 When lifting the Muskie or Tiger Musky out of the water for a photo seek advise from my tackle shop in our lodge as to the proper way to hold the Muskie / Tiger Musky around the head area as this is very hard to describe in a writing, never hold the fish vertical, and always support the under belly with your other hand. This also holds true for handling Northern Pike. 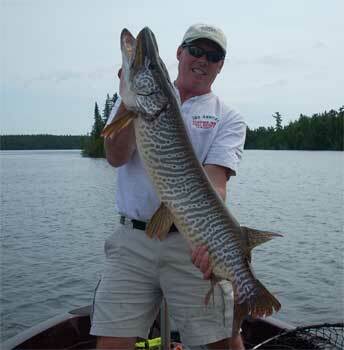 When unhooking a Muskie / Tiger Musky, or Northern Pike don't place it in the bottom of the boat. This prevents removal of protective slime and damage from the fish thrashing around in the boat. Keep its head in the water. It can't breath in air and needs oxygen as the fish is tried from the fight, just like you feel a little tried and winded. Don't yank on deeply in-bedded hooks; cut them out with bolt cutters. Barb less hooks are a great option when good technique is applied while fighting, a Muskie, Tiger Musky, or Northern Pike. I personally cannot blame the loss of a Muskie, Tiger Musky, or Northern Pike from using barb less hooks. After unhooking the fish, don't swish the fish back and forth in the water. Hold it upright to breath on its own, give it plenty of time as this can take over 20 minutes, and release it when strong enough to swim off. The fish will tell you when it�? ?s ready, as it will start to twitch and then try to swim away. Spawn Period: This period starts to take place when the water temperatures reach about 48 degrees Fahrenheit and continues through temperatures up to 59 to 60 degrees, with main spawning activity taking place in the mid 50�??s. This is normally about two weeks after the Northern Pike spawn, but a quick warm up or sudden cold spell can advance or delay this yearly ritual. The Muskie spawn always takes place before the third Saturday in June, and as in the Pre Spawn Period, because the Ministry of Natural Resources Ontario Fishing Regulations do not allow fishing for Muskie or Tiger Musky until the third Saturday in June specifics about fishing locations, techniques and lures will not be discussed. To provide some information I have included some interesting facts about the Muskie spawn. Muskellunge and Northern Pike many times inhabit similar habitats, and research in Minnesota revealed a few interesting findings. 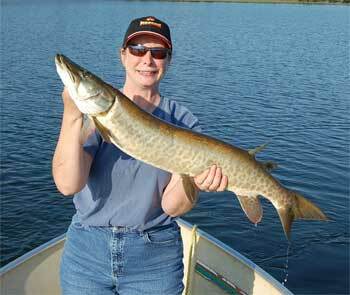 Muskie, in the absence of Northern Pike, tends to reproduce in the same shallow, weedy areas that would normally be dominated by Northern Pike spawning during the spring. However, in the presence of Northern Pike the Muskellunge tend to spawn in slightly deeper water, yielding the more preferred habitat to the Northern Pike. The presence or absence of Northern Pike also appears to impact ultimate growth of Muskellunge. Muskie inhabiting waters without Northern Pike rarely reach total lengths of more than 40 inches, while Muskie in the presence of Northern Pike occasionally surpass 60 inches. Muskie spawning generally occurs when water temperatures are in the 50�? ?s (Fahrenheit), and a 40-pound female releases 18,000 to 200,000 eggs. One or two Male Muskie and a female Muskie spawns by the males rubbing aggressively against the sides of the belly of the female, which causes the eggs to drop, and during the dropping of eggs the males emit there milt which fertilizes the eggs. Muskie eggs hatch out in as little as 8 to 14 days. Muskie larvae eat plankton after absorption of their yolk sac, and soon switch to a diet of strictly fish. 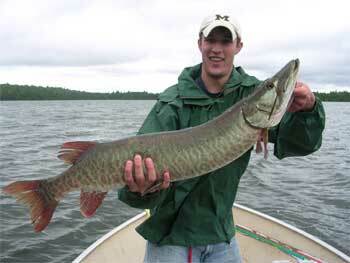 Muskies are considered sexually mature somewhere between three and four years of age. Post Spawn Period: This period sometimes begins before the third Saturday in June but my information will coincide with that week since this is opening week for Muskie and Tiger Musky fishing in Northwest Ontario. Musky movements after the spawn, and the most productive areas at this time, are rocky shore lines with some type of structure like points, sunken trees, reefs, humps, and rock ledges. Also, main lake points, off shoreline reefs or humps, and around streams with a good flow. The best areas lead into deeper water nearby. Structure closest to the spawning bays produce better immediately after the spawn and progressively moves throughout the lake. 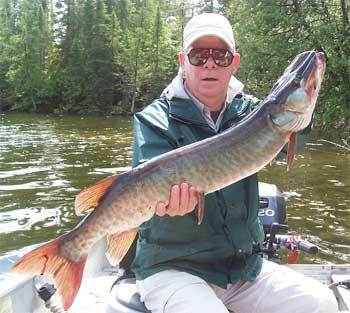 Medium size, or lures considered small for Muskie or Tiger Musky, tends to be more productive during this time period. Presentation is medium to slow, although faster retrieves will have their moments. If you have read about Muskie you will know that their feeding times are infrequent, short, and require some patience to get results. 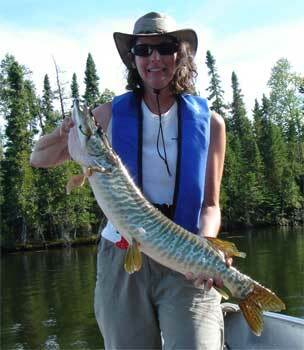 For those of you who have never caught a Muskie or Tiger Musky don�? 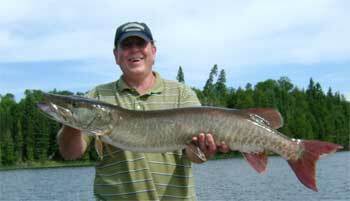 ?t get too serious about the fables of Muskie fishing, as being the fish of 10,000 casts. Just think of Muskie as any other fish species that requires it to feed to live, and a persistent, very inexperienced angler, with some instruction (that�? 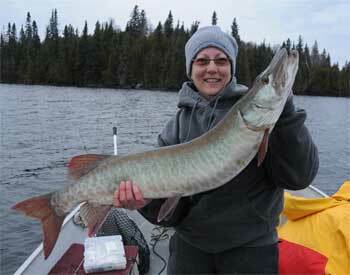 ?s my job from my tackle shop) has a great opportunity to catch their first Muskie or Tiger Musky. After all any experienced Muskie / Tiger Musky angler with a lot of recorded catches was not born with a special talent for catching Muskie, they just learned by fishing. Lure suggestions can be just about anything, and you never know exactly what will trigger a strike, but some favorites at his time are slender jerk or twitching baits either floating or suspending, in-line spinners, swim baits, and soft plastics. Fly-fishing with subsurface flies, or slowly sinking flies like gurglers, divers, or streamers. Fly-rod weight is perfect at either #8 or #9, depending on the size flies being used, and a #7 can be used, and if you want a real work out using a #10 weight with larger flies will be the challenge in itself. Summer Early Period: First of July to third week in July identifies with this period. Water temperatures are in the 60�?�s, which is perfect to trigger Muskie and Tiger Musky to feed actively. Muskie and Tiger Musky do tend to prefer rocky areas like main lake points, rocky shorelines, rock reefs, under water humps, and saddles between islands or an island and mainland. Since Muskie and Tiger Musky move in and out of weed beds the best areas are leading into weed flats or weedy bays, but also having access to deeper open water. Muskie and Tiger Musky move into bays to feed from time to time, but also feed in open water on cisco and whitefish. Lures of many types can be used like, minnow/fish imitating either diving or suspending, swim baits, spinners of all types, and buck tails seem to excel at this time. If the water temperatures are in the high 60�?�s and approaching 70 subsurface jerk or wobble baits will work, and you should try surface baits. Medium sizes seem to produce better, but it�? ?s time to experiment, and the same holds true for retrieve speed. Despite the type of retrieve you are accustom to using, I have always found an erratic and stop / go action during the retrieve to produce more strikes and fish landed. Fly-fishing favorites are subsurface divers, gurglers, and streamers with surface poppers or gurgles stripped fast on the surface working at the end of this period if the water temperatures approach or reach 70 degrees Fahrenheit. Remember that at Fireside Lodge we have a lot of good information to pass on to guests daily through our in-house tackle shop. Summer Period: This period includes the third week in July to late August. 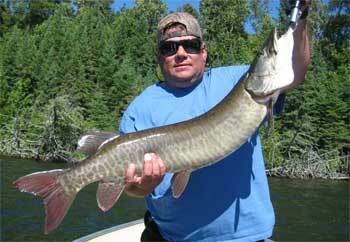 Locations to find Muskie and Tiger Musky will be the same as the Summer Early Period above. Lures to use are minnow/fish imitating either diving or suspending, swim baits, spinners baits, buck tails, in-line spinners, soft plastics, and jointed lures tend to work very well. This is the time you can pull out the big hardware and use bigger lures like jerk baits, wobbles baits, big buck tails, big spinner baits with fancy dressings, large plastics, jigs, swim baits and surface baits. This is the best time of year to use surface baits, and at times the more water churned up the better. Even though it�? ?s a good time for large baits don�? ?t forget that medium size and even smaller baits always produce, especially when the fish are not showing up. Many guests over the last 20 years have been surprised at these suggestions and wonder why, at times, Muskie and Tiger Musky are in a slow feeding mood during a time when their metabolism is working faster. In trying to find a simplistic way to describe why this happens I came up with my snack or cashew theory. Here it is: If I invited you over for supper and fed you a big prime rib meal with all the fixings and 60 to 90 minutes later put another full meal in front of you, in no way would you eat that meal. However, if I put a bowl of cashews nearby, you would probably eat one or two. How does this apply? Well, Muskie get full also, but they are opportunists. Put something small, like a cashew (jig, soft plastic, suspending bait) in front of them and keep it there long enough they will eat it. BINGO, no Muskie, turned into a great Muskie photo, with you in it. Get it!!!! Fly-fishing will be most productive with steamers, gurglers, divers, specialty foam constructed flies, and surface poppers. This is a great time to fish for Muskie and Tiger Musky being able to use the widest variety of methods and presentations, and for some reason more Tiger Musky are caught during this time period than any other. Summer End / Fall Period: Starts in late August or first week in September, depending on weather and water temperatures, and lasts until late September to early October. At the beginning, and for most of this period, locations to find Muskie and Tiger Musky will be the same as the Summer Period above, but as the period progresses the relationship to rock structures increases while lessening towards weeds. At the beginning of this period, sometimes you will find a lot of Muskie and Tiger Musky using weed beds and structure near their spring spawning grounds. The lures, flies, presentations and techniques at the beginning of this period coincide with the summer period, however things change a lot as the period progresses. Aggressive, faster presentations become less effective, and slower retrieves with more finesse become more effective. The lures working the best at the latter part of the period are the type you can keep in front of the fish longer like suspending baits, soft plastics, or jerk baits that work well with long pauses. With surface baits a slower, tantalizing retrieve works better. There will be times in the latter part of this period when aggressive feeding take place, but these opportunities are short lived so adjust as needed. This can be a fabulous time especially during the first few weeks of the period, as the fish are feeding in anticipation of the cooler water temperatures and the winter month�? ?s that follow. Muskie and Tiger Musky will be big, heavy, and full of fight, with a high potential for making contact with the biggest of the big. It�? ?s also a beautiful time of the year with pleasant daytime temperatures and cool evenings, no bugs, and the wonder feeling of fall in the air that are actually becoming visual. Fall / Late Fall Period: This happens between the first to second week in October until the end of November or until ice starts to consume most of the lake, which is about mid-November. We are closed at this time of year do to very unpredictable weather conditions, which causes the same for fishing success. This time of year can bring a lot of cold fronts with very cool to cold conditions, along with cold rain and strong winds at times. It is not unusual to get snow, usually melting quickly, and this probability increases as you get closer to November. The latest my wife and I have fished is the first week in November, and we have had daytime highs in the mid-50�? ?s, to the high 30�??s. This review is strictly based on my personal fishing experiences with my wife Audrey. Locations of Muskie and Tiger Musky have moved to rocks, reefs, main lake points, and main lake humps. The cold-water species we have in our lakes system like Lake Trout, Whitefish and Lake Cisco all spawn, in that order, during this time period so knowing these areas is beneficial. Aggressive feeding is far and few between, and most of the presentations I use is slow, slower, slowest, to a do nothing approach. We use lures that will accommodate this style of presentation like jerk or twitching baits that can be paused for a long time, in-line spinners with no hair so they can be fished very slow. At times we fish them so slow that the blade fails on every turn and knocks against the bell weight creating a clicking noise that you can feel in your line. I will throw a jerk bait or wobble bait that I can move slow, however they have not been the best producers. Our most productive choice is a wide variety of soft plastics, fished slow and at times with a do nothing approach. I know in most of the Muskie world this is un-heard of, but I am not promoting lure sales, I am using what I have found works consistently to catch Muskie, Tiger Musky, and Northern Pike at this time of year. We have caught these fish on other lures, and at one time never thought of using plastics, however after a lot of experimenting and having some days we thought we would go fish-less, to having a great day catching Muskie, Tiger Musky, and Northern Pike because we switched to soft plastics with slow presentations, we soon became strong believers, and still are after 20 years. Even though we are closed if you have the opportunity to fish for Muskie, Tiger Musky, and Northern Pike during the fishing period give it a try and hope you can experience some of the fun Audrey and I have over the years. Winter / Spring Period: The period occurs between mid to end of November (ice up) until spring when the ice comes off the lake. Muskie / Tiger musky season closes in Northwest Ontario on December 1st and does not open until the third Saturday in June the following spring. Since this is a closed season the information for this period is not made available. and all portage lakes are managed as catch and release lakes. both. After all this is what we all go on a fishing trip for. For some examples of what Fireside Lodge guests experienced while fishing at Fireside Lodge go to our Daily Fishing Catches, Fishing Reports, Fishing Photos and Master Anglers Award pages. 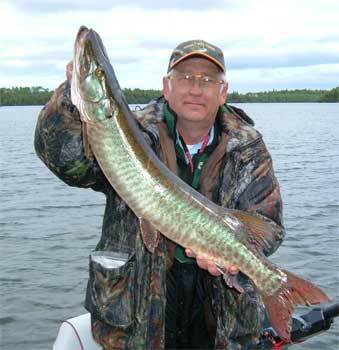 All Photos on this page are Muskie / Tiger Musky that were caught and released by Fireside Lodge guests.